Open your hands/ if you want to be held. / Sit down in this circle. 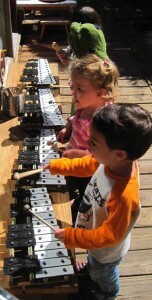 At Children First, you see kids making music indoors and out, playing with all kinds of sound makers and instruments. They explore melody with marimbas and tone bells; tap out rhythms with drums and maracas; and organize themselves into bands and shows and parades. 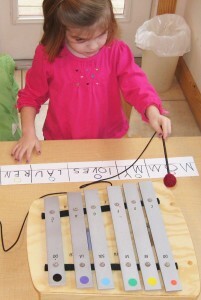 Kids move and sing and create with a variety of recorded music as well as to the music they make themselves. Singing is a big part of our lives at school. We learn many songs that speak to our school’s particular values and culture — songs about optimism and friendship, fairness and feelings, nature and play — and we sing them often, until they become, literally, the sound of our community. 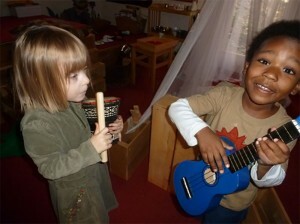 We learn songs that children bring from their families. 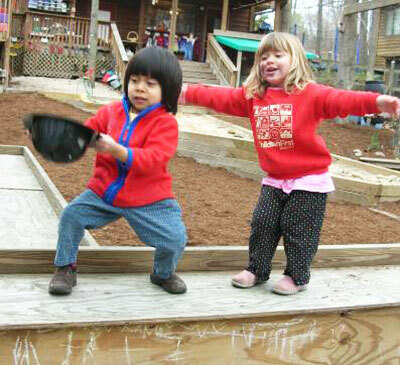 We learn songs that encourage us to move our bodies in coordinated ways, to play with rhyme and beginning sounds, and to count — songs that give melody and spirit to work that often engages our minds in preschool. We sing songs to celebrate, and to mark transitions in our day. We make up our own songs, or sing familiar songs in new ways (high or low? legato or staccato? fast or slow?). We sing at our daily meeting; we sing at pizza potlucks; we sing at the Eno River; we sing, sometimes, instead of talking! And just as children are learning that words they speak can be written down with symbols called letters, they are learning that music can be written on paper with symbols, too. We play with different ways of writing down sounds and songs, and reading them back with our voices and with musical instruments.